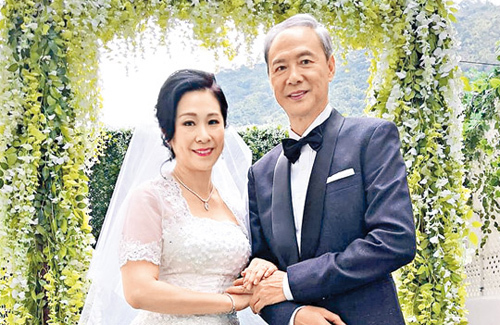 Since the exposure of 62-year-old Chan Wing Chun‘s (陳榮峻) sunset romance with 57-year-old Helen Ng (吳香倫), the couple’s love story has touched many. Chan Wing Chun was a widower who fell into depression and Helen had sacrificed her youth to take care of her mother. The pair was grateful to find each other and have another chance to love. Dating for three years, Chan Wing Chun successfully proposed to Helen at last year’s TVB banquet dinner. The couple recently took their wedding studio photos and will hold their wedding in July. Touched by the speech, even Kristal could not hold back tears and had to pause to hand out tissues to everyone at the interview. Kristal also shared the letter written by Chan Wing Chun’s daughter, who expressed her support for Helen after learning the positive impact on her father’s life. so refreshing that the bride is only 5 years younger than the groom. OMG this is just tooo sweet! I’m so happy that they found each other! congratulation to the beautiful couple! Helen looks beautiful for her age, and CWC looks dapper too.